Officials with the Occupational Safety and Health Administration (OSHA) recently sited Packaging Corporation of America after launching an investigation into the company back in December at the Chelmsford location. The company now faces more than $65,000 in fines for a number of violations, including two repeat violations. “For the safety and well-being of its workers, an employer must take effective steps to ensure that required safeguards are in place and constantly utilized at all facilities,” said OSHA area director Jeffrey A. Erskine. Our Chelmsford work injury lawyers understand that inspectors observed workers at the plant exposed to caught-in, struck-by and crushing risks while working with the machinery on site. Workers were not taking the proper safety precautions when shutting down and locking out power sources. They were also facing some serious risks for being caught in a number on conveyor belts, and were not provided with/using the proper protective guarding. The company was previously cited for these same problems at its Alabama location. A repeat violation occurs when an employer has already been cited for the same (or similar) violation at any of its facilities within the last five years. The purpose of machine guarding is to protect the machine operator and other employees in the work area from hazards created by nip points, rotating parts, flying chips and sparks. Under OSHA’s standard to regulate hazardous energy (or the lockout/tagout standard), machines are required to be powered off at their power sources before anyone can work on them. By doing this, workers and companies can help to prevent accidents, injuries and fatalities. Under the administration’s guarding standard, operating parts are required to be guarded so that workers do not face caught-in risks. Rotating parts cause hazards such as in-running nip-points. Parts can rotate closely to each other in opposite directions while their axes are parallel to each other. When they run closely, the stock fed between two rolls produces a nip point. 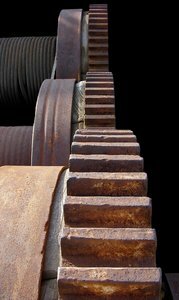 This danger is common on machines with intermeshing gears, rolling mills and calendars. Moving machine parts have the potential to cause severe workplace injuries, such as crushed fingers or hands, amputations, burns, or blindness. Safeguards are essential for protecting workers from these preventable injuries. The guarding device shall be in conformity with any appropriate standards therefor, or, in the absence of applicable specific standards, shall be so designed and constructed as to prevent the operator from having any part of his body in the danger zone during the operating cycle. Because of the lack of safely guarded machines, workers who operate and maintain machinery suffer approximately 18,000 amputations, lacerations, crushing injuries, abrasions and over 800 deaths per year.